Class A Chimneys are used in applications where a standard masonry chimney does not exist and a brick and mortar chimney is not desired nor realistic for the location or application. 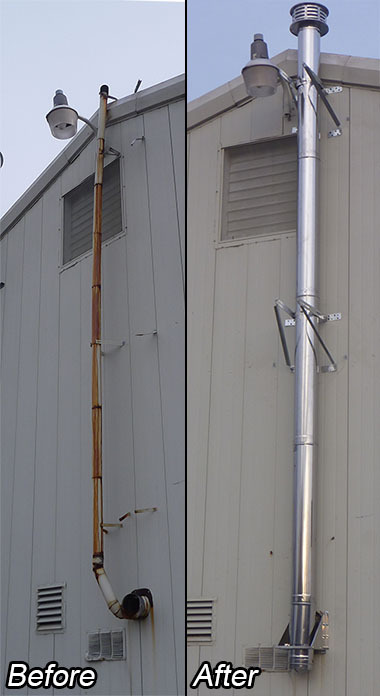 The benefits of a stainless steel Class A chimney include ease of installation, durability & longevity, and the smooth circular construction allows for a far superior draft compared to a masonry flue. After examining all the various brands on the market we feel that Olympia's Ventis series of Class A chimneys are the superior choice. Made from 304L or 316L they are built to last. As we are also firm believers of selling products made in the USA. You can rest assured knowing that the Ventis series of products are made nearby in Scranton, PA.
Can be passed through multiple floors with only 2" clearances to flammables!